NewsCard Pro is a Multi-Purpose Magazine/News WordPress Theme. 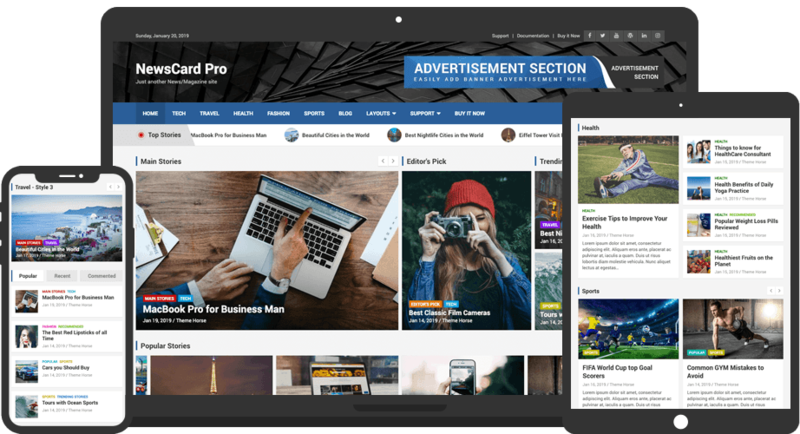 NewsCard Pro is specially designed for magazine sites (food, travel, fashion, music, health, sports, photography), news sites, shopping sites, personal/photo blog and many more. There are Front Page Template, Sidebar Page Layout, Top Bar, Header Image/Overlay/Advertisement, Social Profiles, Banner Slider and many more. Also supports popular plugins like WooCommerce, bbPress, Contact Form 7 and many more. It is also translation ready. Includes powerful color pickers to change color throughout the entire theme. Plus you have the power to change from 11 pre-defined color schemes with one click! Instead of sliding the posts you can also set image slider where you can add individual slides title and redirect link. You can set your own redirect links to the individual slides. This theme supports 700+ Google Font Family for headings and content. Unlimited color options and even various font sizes can be set for individual sections. For the different looks to the Footer Widget Section you can modify the Footer Widget Column to the three different ways as 2/3/4 column. You can individually hide each footer info content (copyright, privacy, theme by and powered by) along with footer info edit option to add your own content. This theme is developed with ‘Bootstrap 4’ framework which is the world’s most popular framework where you can easily use bootstrap elements into your content. Banner Featured slider to highlight your important post along with post title and post meta. Just set the latest posts or posts by category that you want to show in slider. We have incredible support team. You can read our detailed theme instructions and use our support forum. You can mail us and we will quickly answer your questions. This theme has multiple layouts namely left sidebar, right sidebar, no sidebar and full width. You can choose specific layout for your individual page/post as well. Here comes the Premium version of our free theme NewsCard with lots of amazing features as per our user’s suggestions and request. Have a look, what’s new on NewsCard Pro.